Publications – EFCI – European Cleaning and Facility Services Industry. This report has been developed by the Fédération des Entreprises de Propreté (FEP). It gives an overview and assesses the current digital trends in the industry, seeking to anticipate future evolutions in cleaning companies in the years to come. 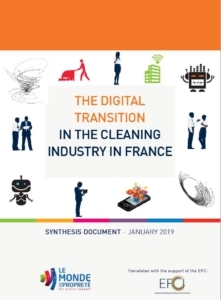 Among other, the report shows that, while the digital transition is changing the way services are provided, in the cleaning sector it impacts less directly the core profession than it does in mechanical industries or in services delivered on-demand and non-recurrent. French brochure (La Transition Numérique dans le secteur de la Propreté) available here. This survey carried out by the EFCI provides a detailed and exhaustive analysis of the sector and its development over the last 20 years. It presents the most important socio-economical indicators (turnover, market penetration, number of companies, number of employees, work organisation, etc.) and compares the situation of the industry with the general economic context as well as with other service. General manual for training and awareness raising concerning security and health in the office cleaning. It deals with the ergonomic aspects (bodily position, working positions, etc) of the most common tasks in the cleaning of premises and integrates of course, as much as possible, aspects linked to safety. This manual has to be set in a training context – either provided in a training centre or in the company itself – and should therefore not be handed over to the workers without any kind of explanation as to its contents. This Manual was created in the framework of the European Social Dialogue with the financial support of the European Commission. This manual presents, in a simple and user friendly way, the most frequent occupational risks in office cleaning and provides preventative measures. It can be used as a support for training sessions (trainers’ manual available upon request), distributed to workers in the framework of awareness raising campaigns, or used by companies’ management in the frame of professional risks prevention schemes. It was realised in the framework of the Social Dialogue with the financial support of the European Commission. This teaching tool offers a full training on CD-Rom in 6 languages for basic office cleaning. It is divided into 8 sessions (floors, furniture, sanitary fittings and fixtures, health and safety, waste collection, work relationships, work organisation, personal development). It allows for evaluation of the trainees through theoretical and practical tests. The whole training session takes 4,5 working days but can be divided into separate sessions. The teaching approach is simple and detailed in the introduction. This kit can be used by training centres or directly by companies. (Realised with the financial support of the European Commission – programme Leonardo da Vinci). Available on cd-Rom in Dutch, English, French, Italian, Portuguese and Spanish.